On August 17, 2017, ripples traveling along the fabric of spacetime passed through a small planet after more than a 100 million year journey, gently stretching and squeezing the pale blue dot by fraction of an atom. Moments later, a split-second burst of high-energy gamma rays finished their journey to our little speck of dust in the Milky Way, with a rainbow of light across the electromagnetic spectrum in its wake. This flurry of information was the long-sought-after holy grail of multi-messenger astronomy. The ripples in space, or gravitational waves (GWs), came from two objects called neutron stars — the remnant cores of long-dead stars as dense as an atomic nuclei, with masses comparable to our Sun packed into the size of a city. The LIGO/Virgo network of three gravitational-wave interferometers witnessed the last 100 seconds of the final inspiraling dance and collision, after the two objects lived and evolved together for possibly billions of years. This event was subsequently named GW170817. Figure 1 shows the final 30 seconds of the inspiraling dance, growing in frequency and in amplitude as the neutron star orbit shrinks and emitted gravitational waves become stronger. However, this is only the beginning of the story. 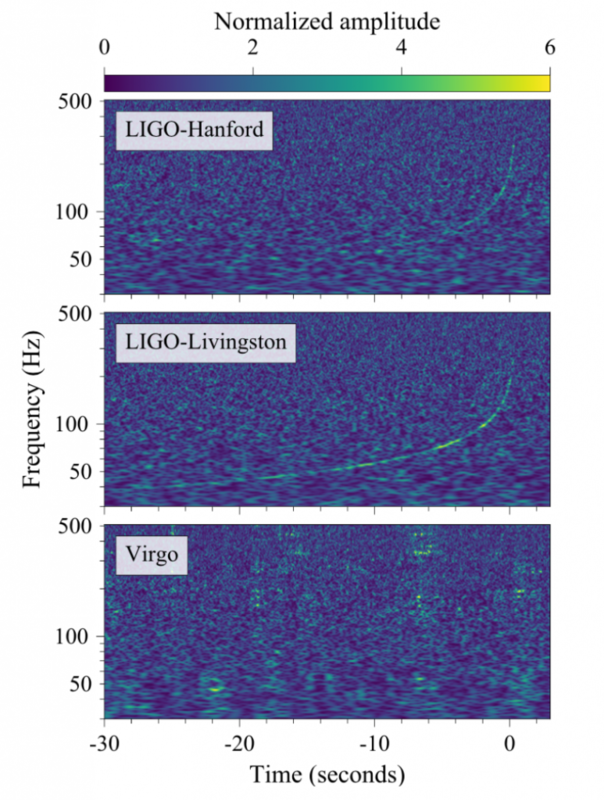 In 2015, LIGO made the first observations of gravitational waves from the inspiral and merger of two black holes, designated GW150914, and since has confidently detected 3 more systems of binary black holes (with the help of Virgo on the most recent discovery — GW170814). However, the detection of neutron stars using gravitational waves remained elusive until the present. Neutron stars provided the first observational confirmation that gravitational waves exist by observing the orbital evolution of the Hulse-Taylor binary. This binary was discovered in the 1970s, and its decreasing period first hinted at the existence of gravitational waves which Einstein predicted sixty years earlier. (It’s discoverers Hulse and Taylor later won the Nobel Prize!). Now, fifty years (and another Nobel Prize) later, we have finally found direct evidence for gravitational waves from a binary neutron star (BNS) system. Based on the gravitational-wave signal, we can gain a great deal of information about the BNS, such as the masses of the two neutron stars, how fast they are spinning, and how far away they merge. The best-measured property of the system that can be gleaned from a GW inspiral is a combination of the two masses known as the chirp mass. This quantity is the primary driver of the “chirp” signal that can be seen in Figure 1. However, other parameters of the system which have higher-order contributions to the signal can also be gleaned from the data. The masses of the neutron stars were found to be 1.17–1.6 times the mass of the Sun, consistent with binary neutron star systems we have found in our own Milky Way. But what object was created when they merged? Turns out, we don’t know! It could either be one of the most massive neutron stars ever observed, or the lightest black hole ever observed! The neutron stars merged about 130 Million light-years away — meaning they collided when the dinosaurs were still roaming the Earth, and have been traveling towards our planet every since. Though this seems far, this is in fact very close for an event to be detected with gravitational waves (about 11 times closed than GW150914). Furthermore, the much lower masses of the neutron stars compared to their black hole counterparts means that they spend far longer in LIGO’s sensitive band, completing about 1500 orbits in band (compared to the ~10 orbits in the case of first GW150914). The combination of its close distance, the long time in band, the increased sensitivity of the detectors, and the addition of Virgo into the interferometer network made GW170817 the loudest GW signal yet! Possibly most important to the story, GW170817 was localized to a much smaller region of the sky than previous GW events — about 30 sq degrees (great for GW localization, but still fairly large, as 30 sq degrees in the sky could comfortable fit 150 full moons!) As neutron stars are made of matter (unlike black holes), they are expected release large amounts of light across the electromagnetic spectrum when they merge. As this is Gravity Spy, we would be in trouble if we did not mention the big glitch that occurred in the middle of the signal in Livingston! The Electrostatic Drive (ESD) system, which controls the test mass/reaction mass that the mirrors are on, discharges when too much signal is sent to the system. This glitch is called an ESD overflow and has occurred many times! See if you cannot find them all (I know some have) in Gravity Spy! Below is a figure from the discovery paper showing the glitch and how the signal power right through it. Also, here is a link to the ESD Overflow As Found On Gravity Spy. You may wonder why the images look different, and it has everything to do with the Q Transform function used to make the spectrograms you see every day. More on this and the glitch to come later! N.B. The first part of this post was written by team member Michael Zevin for AstroBites Please feel free to read the rest of the linked post which describes the Electromagnetic part of the discovery!